- Considerable Inner Design: Build-in super quality velvet which is an excellent buffer for your Google Daydream View - VR Headset! You deserve to own this case. It is a good partner for your trip and a good gift for your friend who also has a Google VR Headset. NOTE: The VR is not included. 100% SAFE: Hard quality EVA material is Semi-waterproof, Shockproof and Durable to protect your VR Headset from impacts and splashes. HAND STRAP: The case features a strong Rubber Handle and lightweight that allows for easy portability on the go. 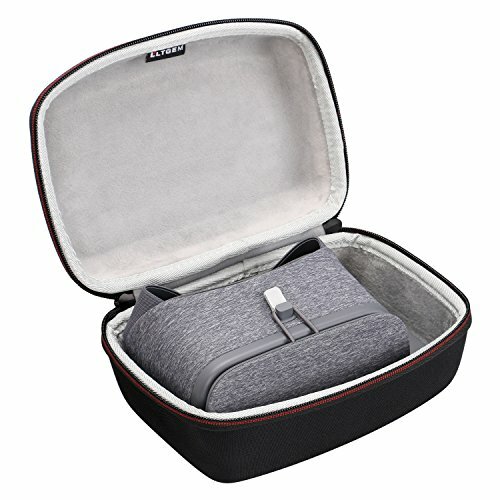 CONVENIENT DESIGN: Inner design have enough space perfectly for controller and accessories, Smooth but strong 360 degree zipper for easy Opening and Closing. ON SALE: Backed by 100% Money back Guarantee, risk-free buy. Only a case ( The VR is not included ) - CLICK the Orange button to Order Now!